On Friday after Maghrib prayer, members of the CAIR-AZ team (Imraan Siddiqi, Yasir Shareef, Neekta Hamidi, and Samantha Noyes) took to the front of ICC’s masjid to host the Friday night halaqa. After the devastating attacks in Boston on April 15th, 2013 many Muslims have not only been dealing with the grief that came along with an attack on our country, but also the backlash due to the suspects claimed religious affiliation to Islam. The topic entitled “Dealing with the Boston Aftermath” in which members of the CAIR-AZ team took the opportunity to discuss the reemergence of Islamaphobia since the attack weeks ago, and how Muslim’s in the Phoenix community need to rise above such actions and set an example for what the Islamic religion truly teaches. It was highlighted that unfortunately due to these events Muslims have become the target of violent attacks and discrimination in many states, and that it is important for Muslims to remember, in the words of one of the panelists, Neekta Hamidi “To not fight fire with fire.” Meaning, to not react in an angry way towards someone who might have something negative to say about the religion. 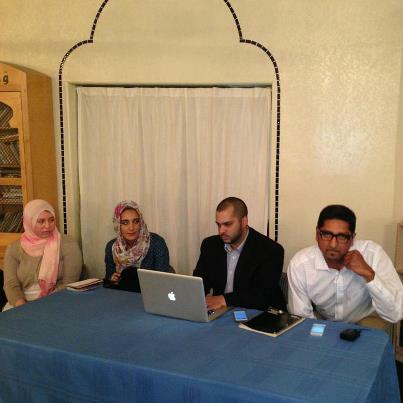 CAIR-AZ also took the opportunity to update the attendees on recent CAIR-AZ sponsored events. Such as the Vigil at Arizona State University, in memory of the innocent lives lost on April 15th. As well as upcoming events planned, such as “Know Your Rights” seminars, discussing a person’s legal rights as a US citizen, plans to bring guest speakers, and Muslim Day at the Hill. Along with these announcements the new CAIR-AZ website was debuted. With a quick tutorial of how the website can be used to find the latest stories, upcoming events, find local elected officials, and how to easily report a discrimination claim to CAIR. At the end of the halaqa, the microphone was turned over to guests, where they could ask the members of the panel any questions or comments. The event had a great turn out with positive feedback and great ideas from those who attended! We would truly like to thank everyone who attended – and thank our community for continuous support. Our chapter has made great progress thus far, and plans to hold great events like this in the near future!